I1909 1925 - 2010 (85 years) Submit Photo / Document Has 13 ancestors and 8 descendants in this family tree. As "Lilly Marr" I was an actress on the New York stage and fashion model for Harry Conover and Lily Dache' back in the olden days. Lillian Skolnick of Longmeadow, MA and Delray Beach, FL passed away peacefully in her home on Sunday, November 21, 2010 at the age of 85. 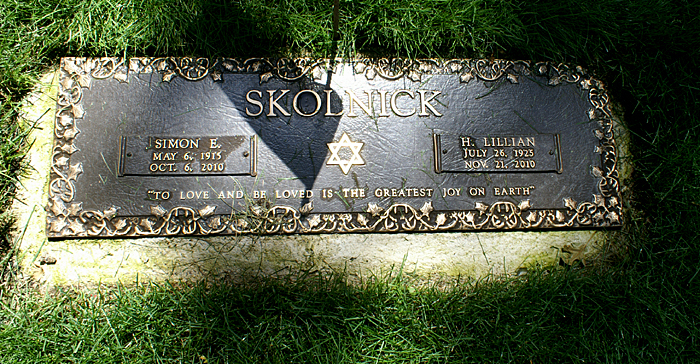 Lillian was the beloved wife of the late Simon Skolnick. Lil and Si spent 61 joyful years of marriage together. Those who knew Lillian acknowledge her sense of style. She will be fondly remembered as "The Lady with the Hat," carrying herself with grace and elegance. Lillian and her brother Justin grew up in Lynn, MA, the children of Ida and Israel Margolskee. Lillian followed her dream to become a stage actress and attended The American Academy of Dramatic Arts. While in New York she had the good fortune of being cast in several plays both on and off Broadway. "Lily Marr," as she was known on stage, also worked as a fashion model. Lillian met the love of her life, Simon, and they were married in 1949. She worked for many years alongside her husband at the store he founded, Bottaro-Skolnick Fine Furniture and Interior Design, offering design services and providing home and office furnishings to the area for over 55 years. They both felt a sense of pride in bringing beauty and elegance through their furniture and design concepts. She and her husband were avid golfers and bridge players and were among the founding members of Twin Hills Country Club in Longmeadow. She and her family were long time members of Sinai Temple and the Springfield Jewish Community Center. Above all, Lillian's true passion was to live a loving life with her husband and children. Lillian leaves her daughter Barbara Skolnick Rothenberg and her husband, David ,of Amherst, MA, her son, Barry Skolnick, and his wife, Laurie of Dallas, TX, and her daughter Susan Gordon of Key Largo, FL. She will always have a special place in the hearts of her five grandchildren: Jeffrey, Sarah, Eddie, Hannah, and Rose Marie. She is the beloved "Auntie Lily" to many nieces and nephews. Lillian will also be missed by her many cousins, loving sisters-in-law and dear friends. The family also wishes to acknowledge the many gentle caregivers and dedicated healthcare professionals who provided their invaluable support. The funeral will be held on Monday, November 22, 2010 at noon at Sinai Temple on Dickinson St. in Springfield, with burial in Sinai Memorial Park. In lieu of flowers, donations may be made to Sinai Temple, 1100 Dickinson Street, Springfield, MA 01108. The Ascher-Zimmerman Funeral Home is assisting the family.